GENETICS’ publication of WormBook in the 21st century is a perfect partnership, because C. elegans research began in GENETICS with the May 1974 publication of Sydney Brenner’s The Genetics of Caenorhabditis elegans – the foundational article that launched an entire field. Since then, some of the most important papers about C. elegans have appeared in GENETICS. So it is fitting that, starting Spring 2016, the journal will publish the definitive review articles on the biology of the organism. WormBook Editor-in-Chief Iva Greenwald studies C. elegans at Columbia University. She investigates cell-cell interactions, signal transduction, and cell fate specification. Her earlier work provided deep insight into the role of Notch in development and the mechanism of Notch signal transduction. 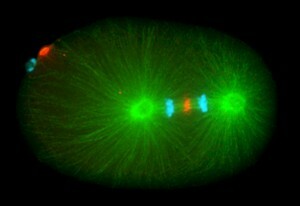 She discusses this work in a GENETICS Perspectives ‘Notch and the Awesome Power of Genetics’ (Greenwald 2012). Greenwald is collaborating with a team of Section Editors, all practicing scientists who themselves have made important contributions to C. elegans research. The Section Editors are helping to formulate WormBook’s topical areas, invite authors, manage reviews, and work with authors to refine the articles. Each month, starting in late spring 2016, GENETICS will publish one or two WormBook articles spanning the breadth of the biology, genetics, genomics, and evolutionary biology of C. elegans. About 60 articles will be published over the next several years. Inspired by the original WormBook, GSA has been working with leaders in the yeast and the Drosophila communities on similar projects in GENETICS, starting in 2011 with YeastBook, a compendium of reviews presenting the state of knowledge of the molecular biology, cellular biology, and genetics of the yeast Saccharomyces cerevisiae. In October 2015, the first chapters of FlyBook were published in GENETICS. Lynn Cooley is Editor-in-Chief of FlyBook, along with co-Editors-in-Chief R. Scott Hawley and Therese A. Markow. “We are gratified that the yeast, worm and fly communities chose to publish in GENETICS these modern ‘books’ that define their fields,” says Mark Johnston, GENETICS Editor-in-Chief. 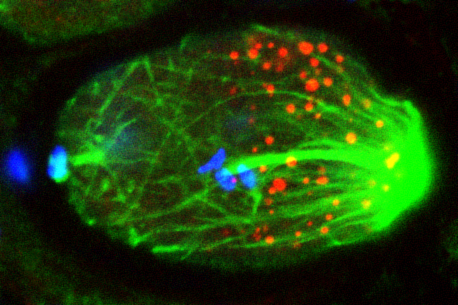 Fixed one cell stage embryo during mitosis, depleted of the dynein heavy chain DHC-1 using RNAi, and stained with antibodies against alpha-tubulin (green), PGL-1 (red, marking P granules) and counterstained with a DNA dye (blue). Image courtesy of Pierre Gönczy. An earlier partnership between the Genetics Society of America (GSA) journals and the worm community continues to be innovative and important. In 2009, GENETICS and WormBase collaborated on a pilot project to integrate scholarly journal articles directly to biological databases – specifically, GENETICS and WormBase. The project provided readers with additional rich information and an interactive experience by directly connecting published literature with entries in model organism databases. Since then, the project pipeline has expanded to include article links in GENETICS and G3: Genes|Genomes|Genetics to Saccharomyces Genome Database (SGD), FlyBase, and soon, FungiDB. Publication expenses for WormBook articles are provided by GSA as a service to the community. Existing chapters of WormBook at Caltech will remain available at http://www.wormbook.org/; several new and updated chapters will appear there over the next months. WormBook founding Editor-in-Chief Marty Chalfie and Greenwald have described these developments in letters to the community. 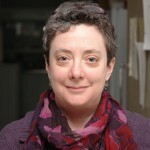 About Iva Greenwald: Her recent work is focused on identifying genes that modulate Notch activity in development and disease, the discovery and elucidation of different modes of regulation and crosstalk of Notch with other signaling pathways during cell fate specification, and investigating how Notch activity is modulated when environmental input is coordinated with temporal progression. She received her PhD degree from MIT, performed postdoctoral research at the MRC Laboratory of Molecular Biology, and was on the faculty of Princeton University before moving to Columbia University. Her honors include election to the U.S. National Academy of Sciences. She has served as an Associate Editor of GENETICS, an Editor of Development, a Section Editor of WormBook at Caltech, and is currently on the Editorial Board and Publications Committee of PNAS. Brenner, S. 1974 The genetics of Caenorhabditis elegans. Genetics 77, 71–94. Greenwald, I. 2012 Notch and the Awesome Power of Genetics. Genetics 191, 655-69. Rangarajan, A., Schedl, T., Yook, K., Chan, J., et al., 2011 Toward an interactive article: Integrating journals and biological databases. BMC BioInfomatics 12:175.